Cook sweet potato in microwave or steam until soft. Mash with a fork and milk set aside. Heat skillet and add olive oil. Immediately add red onions, garlic, corn kernels and coriander. Lightly sauté 2 minutes. In a large bowl combine sifted flours, baking powder, Polenta, yeast flakes and seasoning. Add mashed sweet potato and onion mix to dry ingredients and mix. Finally add eggs, egg whites and enough water to create a thick pancake batter. Dry fry in non-stick skillet for 3 minutes each side or until well browned. Top with 1/2 sliced tomato and grated Parmesan and serve. Nutritional Yeast Flakes have cheese flavour and are a great Vitamin B addition to your meal. The B vitamin is great for metabolism! 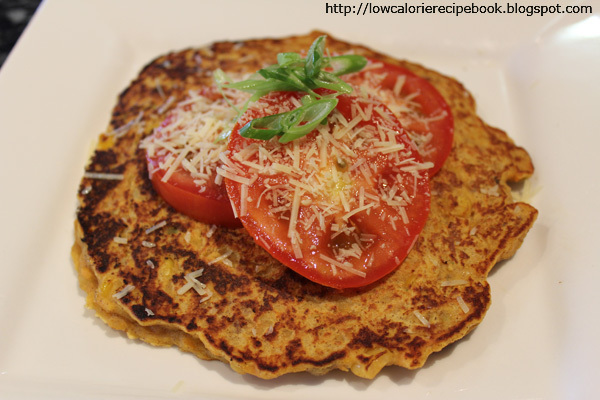 chickpea flour is high in protein as are eggs and will help fill you. NOTE: This recipe is a large filling serve. For a snack or children you may use half the batter recommended.